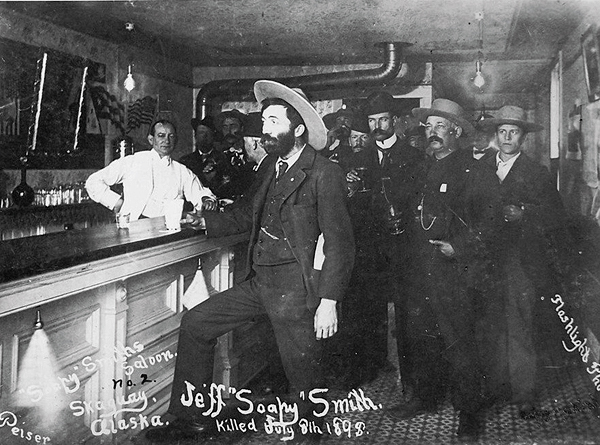 What’s the deal with Soapy Smith? Back in the old west, there were many outlaws who became famous for their ruthlessness. By 1898, most of the west was colonized, but Alaska remained an untamed wild frontier. When the Klondike Gold Rush began, thousands of Stampeders came to Skagway. There were about 10,000 people living there during this time, and many were unschooled in the ways of the world. These Cheechakos, as they were called, were ripe for the plucking, which is why outlaws descended on Skagway ready to take what they weren’t willing to earn. We tend to glamorize the outlaws of the old west, but if we were robbed, beaten, swindled or shot, we probably wouldn’t take too kindly to it. The truth is that men like Jessie James, the Dalton Gang, and Soapy Smith were just total jerks that ripped people off, assaulting and battering their way to infamy. So, what’s the deal with Soapy Smith? What made him such a big jerkface? It’s 1898 and you’re fresh off of a crowded steamship from Seattle. The journey took weeks and you’ve already been away from your friends and family for over two months. You’re lonely, don’t know anyone other than the people you met on the steamship, and you’re almost out of money. You decide to get a room, eat a warm meal, and send a telegraph home to your family to let them know you made it. As you exit the boat, you encounter someone dressed as a clergyman who offers to help you find all of the things you need. My, these people in Alaska sure are nice. The next thing you know you’re sending a $5 telegram back home in a place of business owned by one Jefferson Randolph Smith. What you don’t know is that the telegraph line goes right out of town and into the ocean where it stops. You just got taken, sucker. So, the nice clergyman offers to buy you a drink, so you head over to Jeff. Smith’s Parlour for a little hooch and friendly company. After drinking a few shots of rotgut, someone says that “Soapy Smith” is outside and a crowd is gathering. You head out the saloon doors and see him up on a pedestal with a bar of soap outstretched in his hand. The crowd is excited. Soapy then says that he placed money in some of the bars of soap. Some have $20 bills, and one has a $100 dollar bill. He offers the bars of soap to the large crowd for $1 a piece. One man rushes up to Soapy and buys a bar. When he opens it, there is a $20 bill tucked neatly inside. The man is ecstatic and shows it to the crowd. The gathering all goes wild buying bars of soap so that they can win one of the lucky prizes. You do the same. In fact, you buy 10 bars because that makes your odds of getting that $100 even better. Unfortunately, there are no more winners. You are down $10 and the soap doesn’t even smell very good. Good job. You just got hoodwinked. Stumbling out of the front door of the saloon, you make your way down a dark alley. A group of four men approaches and one of them cracks you on the noggin with a sock full of coins. The world goes dark. When you come to, all of your money and personal possessions are gone. Congrats, Cheechako, you just got ganked for your roll by the king of skullduggery, Soapy Smith. What makes it all so frustrating is that Soapy Smith could have just robbed you when you first got off the boat, but he took such pleasure in utterly humiliating you that he dragged it out to savor every moment.